Ribarica 4 km from Karlobag: Modern apartment block "Sani". 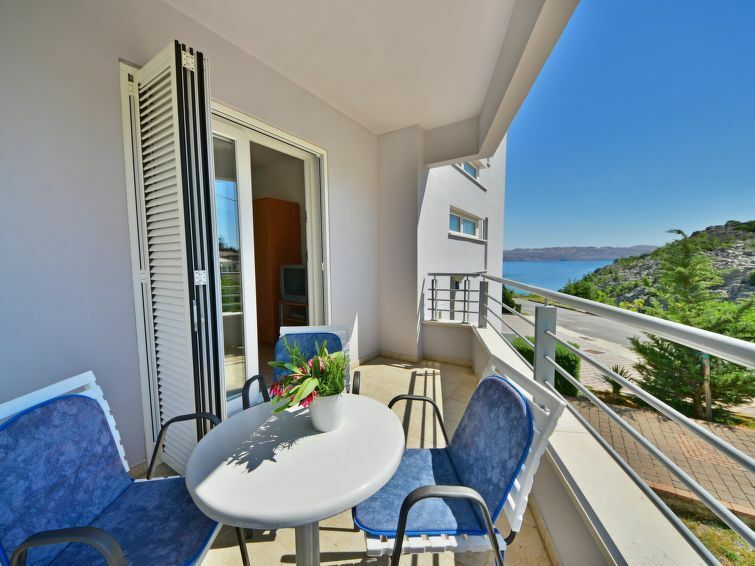 In a sunny position on a slope, 90 m from the sea, 90 m from the beach. For shared use: swimming pool angular (8 x 4 m, depth 140 cm, 28.04.-29.09.) with internal staircase. Outdoor shower, terrace, garden furniture, barbecue. In the house: internet access. Available: boat (extra). Parking on the premises. Shop, restaurant 350 m, pebble beach 90 m.
2-room apartment 50 m2 on 1st floor, west facing position. Beautiful and cosy furnishings: dining room. 1 room with 1 double bed (2 x 80 cm, length 200 cm). 1 room with 1 double sofabed (160 cm, length 190 cm), satellite TV and air conditioning. Exit to the balcony. Open kitchen (4 hot plates, oven). Shower/WC. Air-conditioning (extra). Balcony 7 m2. Terrace furniture. View of the sea. Facilities: Internet (WiFi, free). Please note: private mooring (extra). 1 small pet/ dog allowed.